This nicely seasoned layered casserole will quickly become a requested family meal. The savory layers of ground beef, tortillas, peppers, and cheese make it a whole meal in one dish. 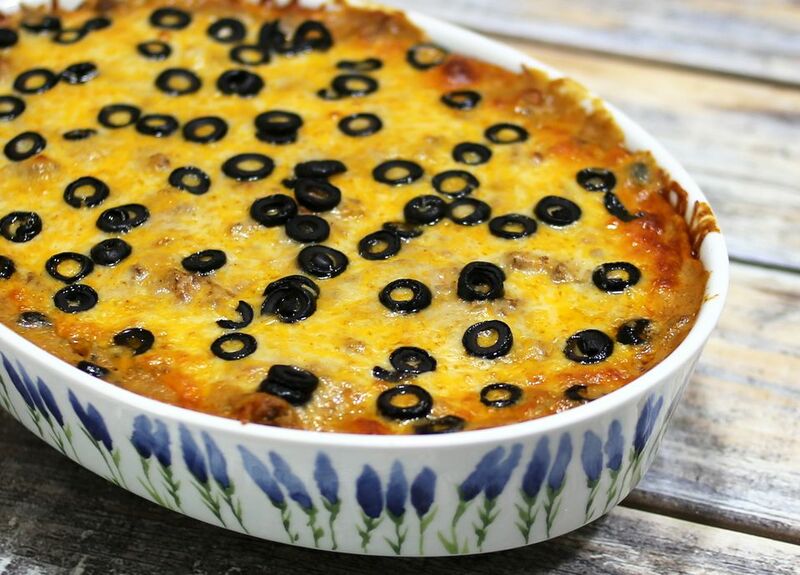 Serve this delicious Tex-Mex casserole with a tossed salad or fresh salsa for a fabulous dinner. In a large skillet cook ground beef and onion until beef is browned. Drain well. Stir the salt, pepper, chili powder, cumin, olives, tomato sauce, and chile peppers into the meat mixture. Bring to a boil. Remove from heat. In a greased 2 1/2-quart round casserole, alternate layers of lightly buttered tortillas, the meat mixture, and shredded cheese, ending with cheese sprinkled over top. Add water, and cover with lid or foil. Bake at 400 F for 30 minutes. Garnish with ripe olive slices, chopped green onions, and fresh chopped tomatoes.